While reading September's issue of Food Network Magazine, I came across an interesting article about different ideas of snacks to roast over an open fire. Whereas I am NOT a camper, I still felt led to share this! My friends and I still joke about "glamping"- my version of camping, glamour-camping. We got that idea from USA Today, you can read the whole article here. 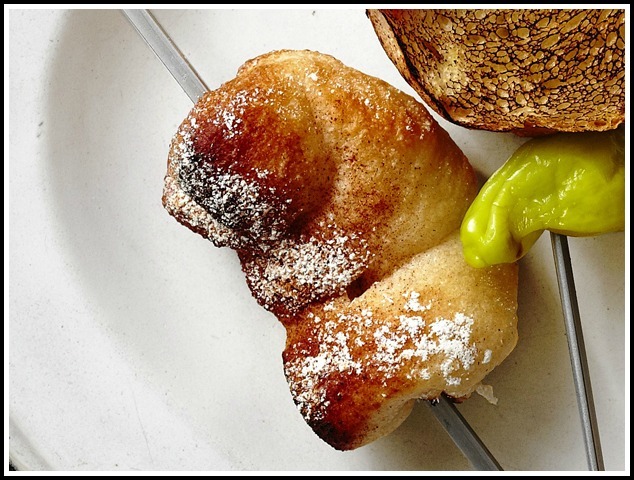 -Cut strips of refrigerated breadstick dough in half crosswise; thread a piece longwise onto each skewer. Toast over a flame until golden. Brush with melted butter, then sprinkle with confectioner's sugar and cinnamon. -Split open an Italian sub roll; drizzle the inside with olive oil and fill with sliced salami, provolone, and fresh basil. Cut into 2 inch pieces. 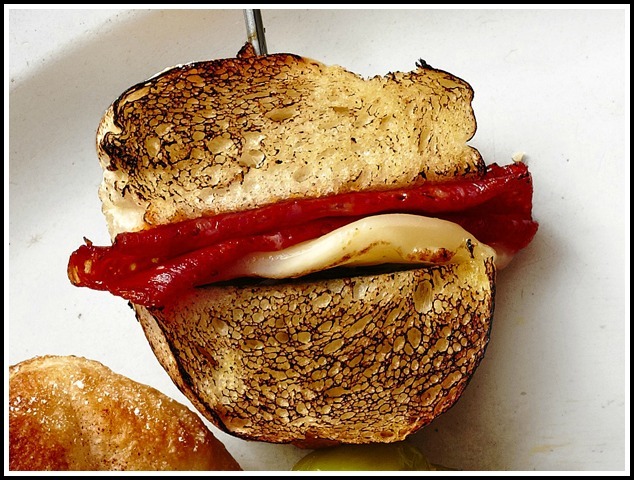 Thread a pickled pepper and a sandwich piece onto each skewer; toast over a flame until cheese melts. -Cut pound cake into squares; spread with dulce de leche. 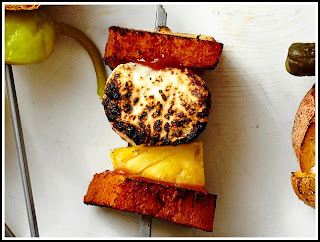 Thread a square of cake, a chunk of pineapple, a marshmallow, and another square of cake onto a skewer; toast over open flame until marshmallow is browned. -Spread mayonnaise on sliced white bread. 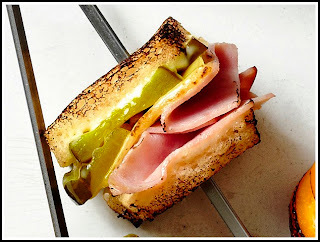 Sandwich with sliced ham, swiss cheese, and pickles. Trim the crusts and cut into quarters. Thread a quarter onto each skewer; toast over a flame until cheese melts. 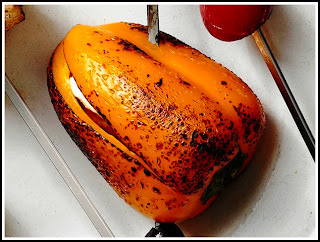 -Slice open baby bell peppers. Scrape out the seeds. 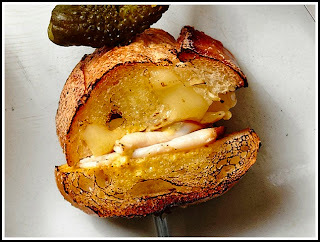 Season the insides with salt and pepper and stuff with a cube of haloumi or feta cheese. 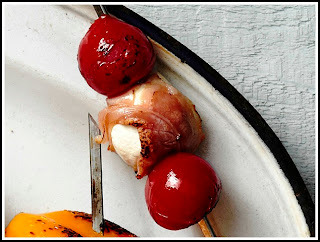 Thread an olive and a stuffed pepper on a skewer; toast over a flame until the peppers blister. -Wrap prosciutto around mini mozzarella balls. Thread a cherry tomato, a prosciutto-wrapped mozzarella ball and another tomato onto a skewer. Toast over a flame until tomatoes blister. -Split open a baguette; spread the inside with dijon mustard and fill with sliced smoked turkey and brie. Cut into 2 inch pieces. Thread a cornichon (sweet pickle) and a sandwich piece onto each skewer; toast over a flame until cheese melts. Now if these don't make you want to camp, I don't know what will! !